This was my first motorcycle that I got for my 16th birthday back in April of '06. I loved this bike and rode it as often as Ohio weather would permit but recently upgraded to a slightly bigger bike, and 883 Sporty. I just got a 2008 Rebel, my first bike...I'm new to riding...My husband bought me a Harley Sportster 883, but I wasn't comfortable on it....I'm takin' it slow...took the motorcycle safety course last year, and had a blast!!!! I got a Rebel as my first bike - but it was just last year and I'm 45+ Never ridden before last year - now I've got a Suzuki SV650. From one in OHIO to another. This weather stinks. Can't wait to ride! Those Rebels are cute little bikes for sure. Fun to ride around town. 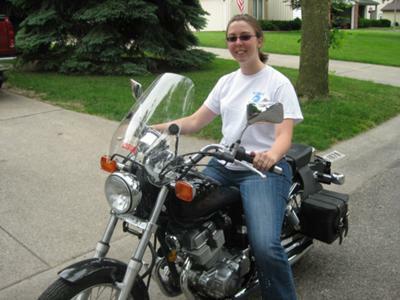 Now lets see a picture of your "big girl" motorcycle. Have fun! You go girl, how bout pic of new bike.